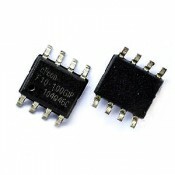 Serial Flash Memory IC Chip - 25X16AVSIG 16M-BIT SOP-8 Part number: 25X16AVSIG Pin: SOP-8 Part type: Serial Flash Memory IC Chip Κατάσταση: Καινούργιο Μέγεθος μνήμης: 16Mbit Εγγύηση: .. Serial Flash Memory IC Chip - MX25L3205DM2I-12G MX 25L3205DM2I-12G 32Mbit SOP-8 Part number: MX25L3205DM2I Pin: SOP-8 Part type: Serial Flash Memory IC Chip Κατάσταση: Καινούργιο .. Serial Flash Memory BIOS IC Chip - PH5XB SOP-8 Part number: PH5XB Pin: SOP-8 Part type: Serial Flash Memory IC Chip Κατάσταση: Καινούργιο Μέγεθος μνήμης: Εγγύηση: Χωρίς Εγγύηση .. Serial Flash Memory IC Chip - WINBOND W25Q128FVSG W25Q128FVSIG W25Q128FVSSIG W25Q128 SOP-8Part number:25Q128FVSGPin:SOP-8Part type: ..
IC Chip - 8 Mbit SPI Serial Flash IC Chip - SST25VF080B-50-4C-S2 8 Mbit SPI SOP-8 Part number: SST25VF080B Pin: SOP-8 Part type: Mbit SPI Serial Flash Κατάσταση: Καινούργιο Μέγεθος μνήμης: ..